North Denes North tower mill No. 2A was built in 1841 in what later became Nelson Road, to replace smockmill_No.2. The mill used patent sails on a cast iron windshaft to power two pairs of French burr stones and a flour mill. A Capital new Brick TOWER WINDMILL with a Dwelling House and convenient Outbuildings attached situate on the North Denes of GREAT YARMOUTH and now in the occupation of Mr. Mayers. The above Mill has Patent Sails and Iron Wind Shaft, drives two pair of French Stones, is capable of manufacturing about three lasts of corn per week and is now in full Trade. Possession may be had at Lady day next or before if desired and part of the Purchase Money may remain on Mortgage. Apply to Messrs. RANNEY & WATERS, Solrs. Yarmouth. Rate at 1s. 4d. in the Pound £2. 2. 8d. Rate at 1s. 2d. in the Pound £2. 9s. 3rd Quarter Made 2 November 186 at 1s. 2d. House, Garden, Granary Mill, Stable & Land. Rate at 1s. 2d. in the pound £- 2s. 11d. On the west side of Nelson Road at its commencement is the Cemetery already mentioned. On the east-side opposite the Cemetery stood "Ransome's Mill" which burnt down in 1852. Further south on the same side is "Skinner's Mill" ... In 1867 a man employed in this mill got entangled with the machinery and was crushed to death. WOOLVERTON & DEORGE will Sell by Auction (where now standing), North Nelson Road, Great Yarmouth on Wednesday June 11, 1879 at 12 o'c precisely, in One Lot, all the MACHINERY, and Going Gear of the MILL lately occupied by Mr. SKINNER (and recently purchased by the Great Yarmouth & Stalham Railway Co. who required the land) comprising Cap with four Sails in good condition on Iron Shaft and Bearings complete, two pairs of Stones (one nearly new), Hoisting Gear with Cog Wheel, Flour Mill, Hopper etc. The above Machinery and Gear will be sold to be removed at the Purchaser's expense within 21 days from the day of sale. The Brickwork of the Mill will not be sold. Further particulars of the Auctioneers, Great Yarmouth. It is possible that the mill's brickwork was purchased by the Great Yarmouth & Stalham Railway Co. in order to assist with their building work. 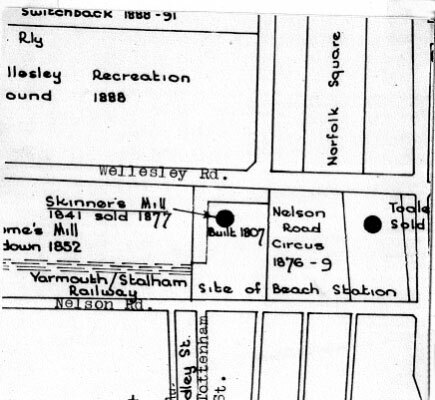 At the other or east end of the system was another railway called the Great Yarmouth & Stalham Light Railway, which had received its Act on 27 June 1876. The Act authorised the line to commence at the centre of windmill known as Skinner's Mill on the east side of Nelson Road and to continue for a little over 16¾ miles to the west end of Stalham. ... east of Tottenham St. was Mayer's (later W. B. Skinner's) mill.